MC1o is the brainchild of materials scientist John Rogers, who’s been chiselling away at the concept of truly wearable sensors with his University of Illinois at Urbana-Champaign research group for years. Now, it’s launched two products: one intended for high-end research, and the other to help you keep safe in the sun. They may not be the most tattoo-like designs in the world, but they are some of the first truly flexible wearable sensors to hit the market. The BioStamp Research Connect, pictured above, is intended for use by health researchers. Its thin, flexible frame contains inertial sensors and a gyroscope to monitor movement, and well as chips to keep and eye on the electrical activity of your muscles and heart. It weighs just 0.2 ounces, and is about a tenth of an inch thick—so it’s like a slightly oversized Band-Aid. It runs for 36 hours on a charge of its 15mAh battery, and beams data to researchers via Bluetooth. It goes on sale later this year, but expect it to be bought up by researchers rather than everyday consumers. In some contrast, MC10 has also created a device in collaboration with L’Oréal called the UV Patch. It’s a thin sticker that’s designed to tell you how badly you skin is being damaged by sunlight. Its surface contains dyes that change color during expose to UV radiation, and wearers can take a photograph of it with a smartphone to find out if they should seek shade. 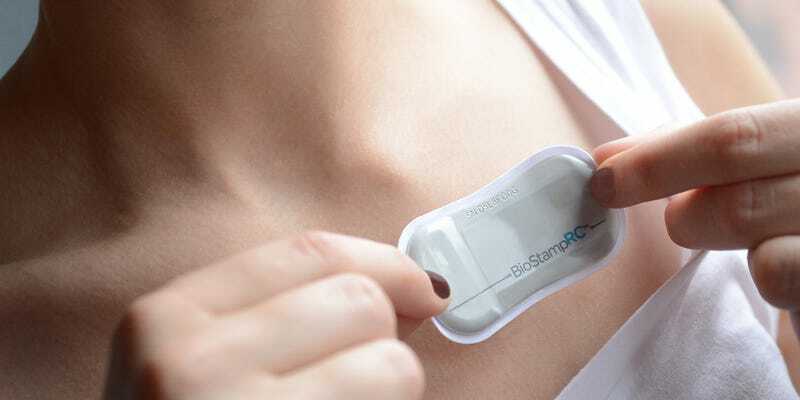 Not, perhaps, as hi-tech as the patch designed for researchers—and frankly neither are particularly like the sci-fi dream of the bio-electric tattoo. But then they are some of the first of their kind, so you can probably expect to see things move in that direction pretty damn quickly.